"I am writing this because I am a widow. That means my husband died, but I did not die." Before Bonnie Shapbell's husband died, he made her promise she would be OK. She kept that promise, rebuilding a joyful life without him while cherishing her memories. Now she offers a helping hand to those on a similar journey. 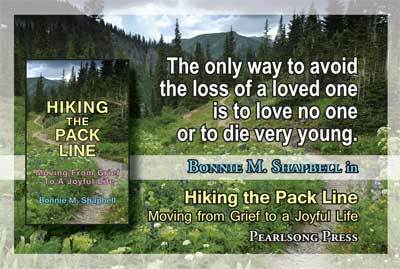 Hiking the Pack Line provides practical advice and a workbook section for those who want to create—or re-create—lives that nourish them after devastating loss. 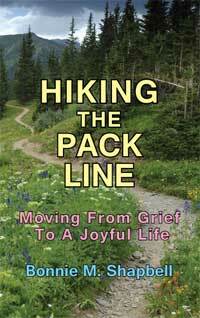 Foreword by clinical psychologist & publisher Peggy Elam, Ph.D.
partner, beloved friend, or even a bad divorce. Great reading and very useful workbook!" and was just at the beginning of figuring out her life. and watching her succeed in making a new life over the years has been inspiring. I love the mix of personal sharing, encouragement, and very practical advice in her book. 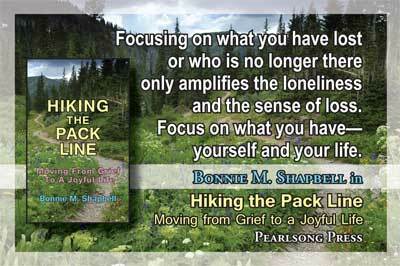 "Bonnie Shapbell has not merely written a book. Rather, she has shared from the depths of her inner being. She has shared from her pain, her anguish, and her healing. The heart of her reader."